The Persian Gulf has come to represent one of the most strategically significant waterways of the world. In terms of geography, geopolitics, resources, global political economy, and regional influence, the Gulf is perhaps home to the world’s most significant group of countries. Focusing on the complexities of the interplay between domestic-level changes and region-wide interactions, this book presents the reader with the first comprehensive survey of the dynamics of change in this crucial area. Systemic-oriented in its approach, the impact of war and revolution on the countries of the sub-region is discussed, and the ways in which these factors have shaped the security dilemmas and responses of the Gulf States is also explored. The role of oil is examined in terms of the impact of its income on these states and societies, and the manner in which oil has shaped the integration of these states into the global system. Oil has shrunk developmental time in these countries, and has accelerated generational shift. At the same time, it has created the dialectical relationship which now characterizes the difficult balance between prosperity and instability which is at the heart of the sub-region. Casting new light on the workings of a strategically significant part of the international system, this book will be an essential resource for students and scholars of international relations, international security and Middle Eastern politics. 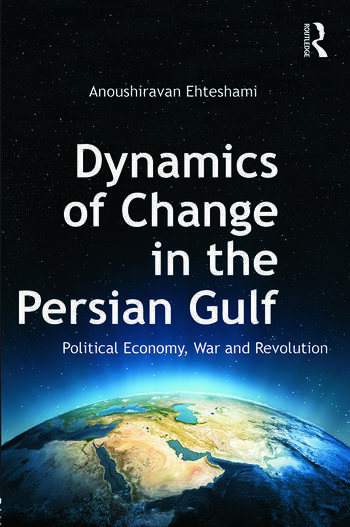 Anoush Ehteshami is Professor of International Relations at Durham University, UK. He is Joint Director of the ESRC-funded Durham-Edinburgh-Manchester Universities’ Centre for the Advanced Study of the Arab World (CASAW), whose research focus since 2012 has been on the ‘Arab World in Transition’. He was the University’s Dean of Internationalisation, 2009-2011 and was the founding Head of the School of Government and International Affairs at Durham University (2004-9). He has been a Fellow of the World Economic Forum, and has been elected as a member of the WEF’s foremost body, the Global Agenda Councils. He was Vice-President and Chair of Council of the British Society for Middle Eastern Studies (BRISMES) 2000-2003.